My local library, which is allied with over a hundred other area libraries, continues to be a wonderful way for me to read the books and comics I would otherwise not be able to afford to read on my very limited budget. 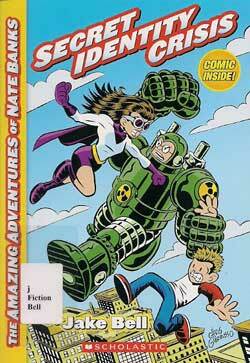 Among the most recent books I got through the library system was The Amazing Adventures of Nate Banks #1: Secret Identity Crisis by Jake Bell [Scholastic; $5.99]. It's a juvenile novel that includes a 8-page comic drawn by cover artist Chris Giarrusso. Nate is a middle-school student in a world where super-heroes exist and, by virtue of his mania for the comics based on those heroes, is an expert on all things super-heroic. Of course, he still has to cope with bullies, homework, and classroom boredom. In Crisis, Nate's town of Kanigher Falls gets its first super-hero, a particularly secretive lady named Ultraviolet for the prominent color of her costume. His quirky science teacher assigns the failing Nate an extra-credit paper in which the lad must use scientific method to find out all he can about the new super-hero. Cue the peril. Bell writes a lively story, one which can be gleefully enjoyed by older readers, though those older readers, and some younger ones as well, will doubtless see the plot twists coming. Bell also has a mildly annoying habit of naming virtually every street, school, and city after comics creators. Nate attends Ditko Middle School. There's a Kubert Movie Theater and a Schaffenberger Bridge. Still, it's a harmless affectation that his intended audience likely won't notice. I can't deny the man his fun and, above all, this little book is fun. I liked it well enough to request the second book in the series - Freezer Burned - and to give him an impressive four out of five Tonys. Amusingly, another library loan had the same title as the Bell book. 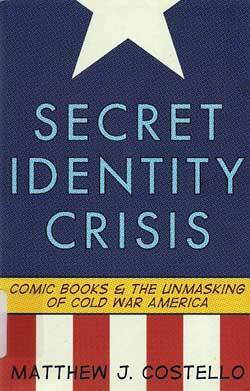 But Secret Identity Crisis: Comic Books and the Unmasking of Cold War America by Matthew J. Costello [Continuum; $26.95] is anything but fun. Costello analyzes every plot development in Captain America and Iron Man comic books in the context of the Cold War, largely ignoring the creative and editorial decisions behind those developments. It's the view of an outsider trying to codify the whims of editors and writers to fit his theories and doing so without apparent knowledge of how things work in the industry. I'd forgive him this - Lord knows we've seen plenty of wacky theories from fans playing detective over the decades - if the writing itself wasn't so dull and tedious. Is there some sort of academic law that says books like this can't be written well? This Secret Identity Crisis gets one Tony, but that's for something that has little to do with the book itself. Costello gets the point for mentioning Nomad, an interesting, quirky Marvel title from the 1990s. I never followed this title, written by Fabian Nicieza, on a regular basis because there was so much stuff coming from Marvel in the 1990s. Now that my memory's been jogged, let me the first of what I hope will be a great many comics readers urging Marvel to publish the Essential Nomad as soon as possible. I wouldn't wait for the library to get that volume. I'd buy it myself. 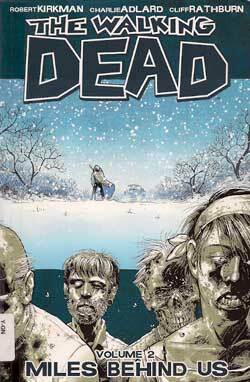 I'm also using the library to read The Walking Dead by Robert Kirkman. I read The Walking Dead Volume 2: Miles Behind Us [Image; $14.99] a few days ago and, though I'm not remotely a fan of any zombie outside of Simon Garth, this ongoing story of survival has definitely captured my interest. If I may be allowed to channel my old boss Stan for a moment, this is "the zombie comic for readers who hate zombie comics." The premise is your typical "group of humans trying to survive in a world of hungry zombies," but the emphasis is solidly on the humans and their relationships. The gore is kept to a minimum and, two volumes into the series, has yet to strike me as gratuitous. This second collection in the series - and, presumably, future volumes - could have used a "What Has Gone Before" page to help a reader keep track of the cast, but writer Kirkman is skilled enough that I never felt like I was out of the story loop. On the visual end of things, Charlie Adlard is every bit as terrific as he was on The X-Files comics that he drew for Topps Comics. Though there have been other collections since, I plan to read the series in these volumes of six issues each. Based on the two volumes I've read, The Walking Dead earns an impressive four out of five Tonys. On a scale of one to ten, how snarky is it for me to wonder out loud if the new digs came with a hot tub for Executive Director Charles Brownstein? I'm going there right now to donate $25 for the above joke. I almost felt bad enough not to use it.